I cannot do without my Tim Hortons in the morning! Let’s paint the picture… you wake up, get ready to leave for work, get in your car… and the first stop is Tim Hortons. It is either tea, coffee, a donut, a cookie… whatever. Your first stop is the official start of your day. So for me… I cannot do without my Tim Hortons in the morning! I had a lot of people comment on this post. Some even bought Tim’s take home coffee, and took it overseas with them! This one from Michael totally cracked me up… because it is so true! 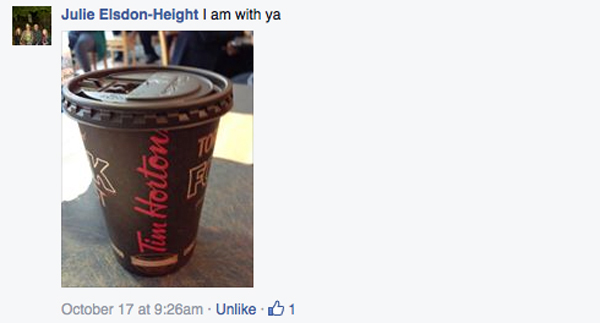 You are so right Troy… hockey and Tim Hortons do go hand in hand. Nancy considers her Tim Hortons coffee “comfort food”. Sit down, relax, enjoy a coffee, and reflect on life. Bravo Tim Hortons. You brought one back to the dark side… er… roast. It’s amazing how many people start their days with Tim Hortons! Do you prefer to grab a Tim’s on the way to work? Or do you prefer to brew your own every morning?